Workers picking America’s produce face rampant wage theft. The Department of Labor is barely using its toughest tool to stop it. 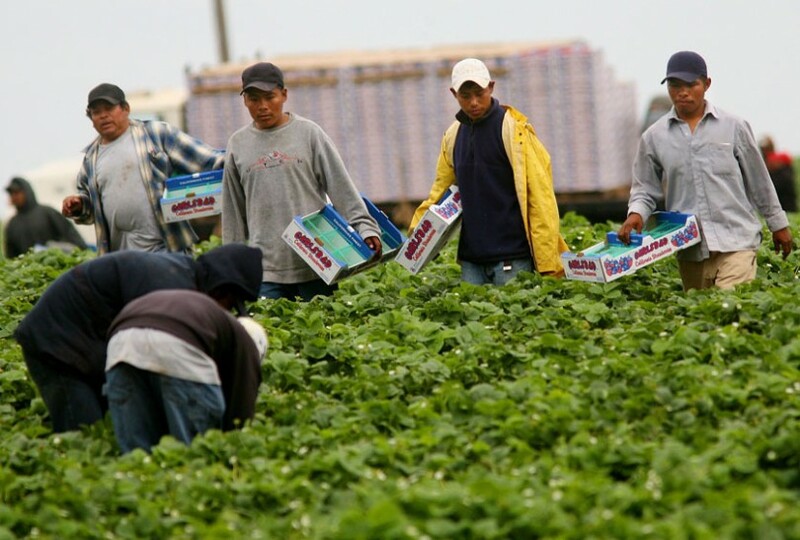 Hispanic farmworkers harvest Strawberries at a farm April 28, 2006 in Carlsbad, California. The debate in Washington continues over whether to create a temporary guest-worker program for immigrants wishing to find work in the United States. It is several minutes before sunrise when Felix Vasquez steps out of his truck, pulls an orange beanie over his head to ward off the early-morning chill, and joins several dozen men and women heading into the strawberry fields of Oxnard, California. By 6 am he has claimed a row of strawberry plants and grabbed a blue tray. Then the work begins. then scurries down the row to drop it off and pick up another. A full tray weighs about 20 pounds. By the end of his 10-hour shift, he will have picked, packed, and lugged more than a half-ton of the fruit. By season’s end, he’ll have done this nearly every day for seven months. On other jobs, Vasquez has been paid an hourly rate, typically California’s minimum wage. But right now he’s working piece rate, so his pay depends on how many trays he fills. “Your body gets tired, but you have to hurry in order to have enough money for when the season slows down,” he tells me that evening. Vasquez has intense black eyes, sports a wisp of a goatee, and is built short and wiry, like a gymnast or marathoner. He rents a room in an apartment for $625 a month just outside of Oxnard, a coastal city 60 miles north of Los Angeles, which he shares with his wife and four children. A family of five rents the other room. He has a bank account but no savings: Though he gets charged monthly for a lack of funds, it’s still cheaper than paying to cash his weekly check. It’s hard for Vasquez and his family to survive on the low wages and sporadic work when the season slows. And it’s made harder, he tells me, because many times he’s not paid what he’s owed: “They think we don’t understand because many of us don’t speak Spanish.” Like many farmworkers in Oxnard, Vasquez is an indigenous Mexican from Oaxaca; Spanish is his second language, after Mixteco. 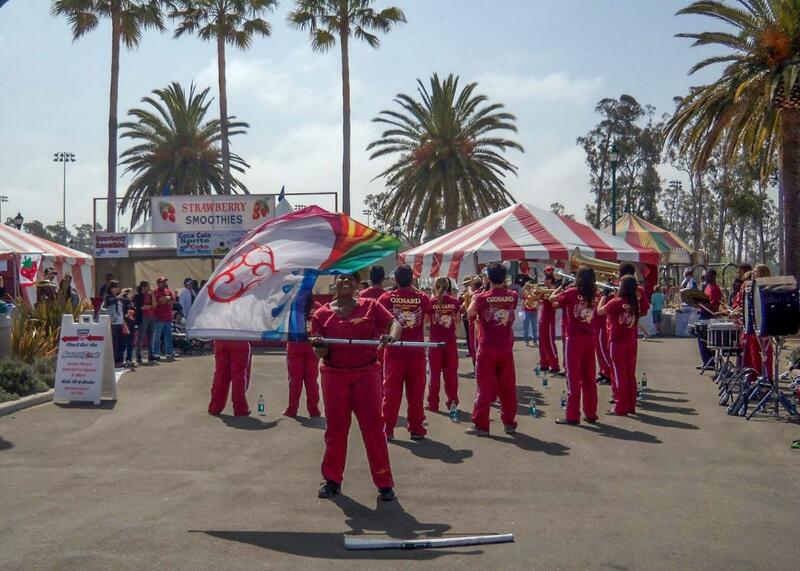 Indigenous Mexicans were once a relatively rare sight in California, but they now make up about a quarter of the state’s farmworkers, according to California Rural Legal Assistance, and local organizers say their presence around Oxnard is much higher. “That’s why they think they can abuse us,” Vasquez says. “Rob boxes from us, mistreat us.” Two years ago, when he worked for a company called Rincon Pacific, he finally took action. The piece was featured on Politico’s “Morning Shift,” a daily focus on employment and immigration policy. Rincon Pacific is part of Rincon Fresh, which describes itself as “California’s largest, family-owned berry farm.” Rincon has large operations in Ventura, Santa Barbara, and Riverside counties growing not only strawberries but raspberries, blackberries, and blueberries that are then sold across the country. Like many companies, Rincon Pacific starts the day with warm-up exercises for its employees in an effort to minimize injuries. But on his first day, Vasquez noticed that they warmed up before clocking in; he figured—correctly, according to federal labor law—that he should be paid for the time. He also found that several hours after lunch, when his energy was flagging, the company didn’t give workers their second break also required by law. “They wanted us to hurry up and finish the field,” he says. Vasquez was working for California’s minimum wage, then $9 an hour. By the second week, he began to suspect the company was loping minutes, and sometimes hours, off his check, and the pickers still weren’t receiving their afternoon break. He did his best to track his hours for several months, filling a notebook with each day’s arrival and departure times. At the end of the season, he brought his notebook and paychecks to the local office of California Rural Legal Assistance, which represents farmworkers. There, advocate Antonio Flores found Vasquez’s notes hard to decipher, but it was clear he was owed money for the farm’s routine failure to provide breaks. Under California law, Vasquez was due an hour of pay for each day he worked through breaks, plus penalties. Flores calculated that Rincon Pacific owed Vasquez more than $2,000 for the missed breaks alone. While denying any wrongdoing, Rincon cut Vasquez a check for $1,500. Read more from our series “The Grind,” which reveals the exploitative and dangerous labor conditions behind our holidays and rituals — from New Year’s resolutions to Christmas shopping. For farmworkers like Vasquez, fighting wage theft is an uphill battle. It’s an 80-mile round-trip to the nearest office of the California Labor Commission in Santa Barbara. Wage claim cases can drag on for months, often to no effect. 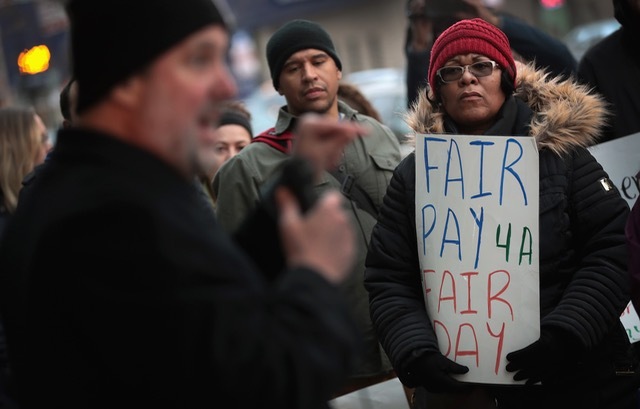 A 2013 report by the UCLA Labor Center found that even when the state determined an employee was owed wages, less than one in five workers actually received money. But there is one particularly powerful tool at the disposal of the U.S. Department of Labor: Tucked within the Fair Labor Standards Act, a landmark bill passed during the Great Depression, is something called the “hot goods provision.” This little-known statute empowers the agency to block products made in violation of wage and child labor laws from being shipped across state lines, compelling violators to pay fines and change their practices. But when I asked Vasquez whether he’d heard of it, he demurred. Hot goods is rarely deployed to protect farmworkers, though one would be hard-pressed to find a workforce that needed it more. Oxnard is a bit strawberry-crazy. The area produces some 630 million pounds of strawberries a year, which are shipped under major brand names like Driscoll’s to consumers across the country and as far away as Japan and Hong Kong. Two weeks before I arrived, the city held its annual strawberry festival, where a record 66,000 attendees feasted on the sweet red fruit in every possible way—deep-fried strawberries, strawberry nachos, strawberry pizza—before washing it down with strawberry beer. Strawberries are Ventura County’s most valuable crop, fetching $628 million in 2014, the most recent year for which there is data. But those profits have come at a cost. The 2012 Strawberry Festival in Oxnard, California. In 2015, the Central Coast Alliance surveyed nearly 300 farmworkers in Oxnard and nearby Santa Paula: About six in 10 reported having experienced wage theft. The methods of theft are diverse, and Vasquez, has experienced most of them at one point or another over his decade in the fields. Some growers simply don’t pay their field hands for all of their hours. Surveyed workers reported being required to work through required breaks, as Vasquez was; being told to show up—uncompensated—before shifts officially began; and being denied overtime pay. (Federal labor law does not require that farmworkers receive overtime pay, but they are due overtime in California after shifts longer than 10 hours.) Another common complaint was that companies regularly undercounted boxes during piece-rate harvesting. Oxnard isn’t an anomaly. In a 2012 survey of 193 farmworkers in New Mexico, two-thirds reported being victims of wage theft within the last year. A 2009 survey of nearly 200 Oregon farmworkers was even worse: Nine out of 10 reported consistently earning less than the state’s minimum wage. The Department of Labor agrees. The agency’s current strategic plan prioritizes enforcement activities within “industries characterized by high labor violations and workers that are reluctant or unable to exercise their rights.” Among the priority industries are fast food, garment work, and agriculture. From 2010 to 2013, the DOL inspected more than 6,100 agricultural employers. According to an analysis of those inspections by Farmworker Justice, nearly 70 percent of these employers violated the Fair Labor Standards Act (FLSA), the Migrant and Seasonal Agriculture Worker Protection Act, or H-2A guest worker provisions—three key laws and policies that set wage standards. There are significant challenges, of course, to cracking down on wage theft in the fields. The workforce is often mobile, undocumented, and isolated. Wage complaints move slowly: The average federal wage-and-hour case takes 125 days to be resolved; by then, a strawberry harvester in Oxnard may be picking blueberries in Oregon. And there aren’t nearly enough inspectors. Since there are roughly 566,000 farms with hired labor in the United States, those 6,100 inspections, conducted over four years, covered just 1 percent of agricultural work sites. Yet as the decades passed, the provision was infrequently used and eventually fell into almost complete disuse. Then, in the 1980s, sweatshops multiplied across Southern California, filled with immigrant workers often earning well below the minimum wage supplying major brands like J.C. Penney, Wal-Mart, and Sears. “We raid them. We fine them. They pay the fines,” California’s deputy labor commissioner complained to the press in 1989. “We have limited capacity to enforce something that’s endemic.” Finally, under the first President Bush, the DOL dusted off the forgotten statute. Hot goods changed the landscape. “To my knowledge, every time we’ve done that [invoked hot goods] to the manufacturers, they have coughed up the money within 24 or 48 hours,” a federal labor official told the Los Angeles Times in 1989, soon after they launched the campaign. Using the hot goods provision gave the agency the muscle it needed to clamp down hard—while also serving as a warning to other businesses. In the last 10 years, the DOL used, or threatened to use, the hot goods clause in more than 2,500 cases, sometimes to spectacular effect. In recent years, President Obama’s Department of Labor has used it to target scofflaw producers for major clothing brands, as in the case of a 2012 raid at the Broadway Trade Center, a hulking Beaux Arts–style building in downtown Los Angeles. The grand structure was once home to a bustling department store, restaurant, post office, and vaudeville theater. But by the time labor investigators descended on the building that August, the glamour was long gone. Much of the first floor was vacant and boarded up, save for a hodgepodge of stalls selling cheap goods. Fifty investigators split up into 10 teams and marched upstairs, where they found 200 garment workers hunched over sewing machines and churching out clothing destined for such retailers as Urban Outfitters and Forever 21. Most workers were being paid less than $6.50 an hour, in violation of the federal minimum wage; none received overtime pay. There were 10 different contractors in the building, and the inspectors cited each one with multiple violations of the FLSA. To recover back wages, the Labor Department turned to its hot goods power. The contractors—and the larger manufacturers who had hired them—were now faced with a simple choice: Pay up or the clothes would stay in the building. The companies quickly came up with $325,000, signed agreements promising to pay more, and submitted to regular monitoring. The operation was one of the 268 hot goods cases the DOL brought that year, for an average of five per week. The garment industry and agriculture have much in common. Both employ a heavily immigrant workforce, pay low wages, engage in widespread labor violations, and—importantly, given the terms of the statute—produce goods that cross state lines. Yet when it comes to farmworkers, the DOL rarely uses its most powerful enforcement tool. Of its uses of hot goods in the past decade, the DOL says the “vast majority” were in the garment industry, but the clause was deployed just 22 times in agriculture. I recently spoke with David Weil, the head of DOL’s Wage and Hour Division, which enforces the FLSA. A former economics professor at Boston University, where he studied policies to protect vulnerable workers, Weil is representative of the more muscular direction the Department of Labor has taken under Obama. In 2009, the agency hired 250 additional labor inspectors, an increase of more than one-third, and has since issued new rules that expanded overtime pay to homecare workers and millions of others, formerly exempt as managers, who earn modest salaries. The DOL has also targeted agriculture with efforts that have faced intense pushback. In 2011, the agency introduced new rules that barred young farmworkers from engaging in a number of hazardous activities, from harvesting tobacco to handling dangerous pesticides. But after a withering campaign from the American Farm Bureau, the agency withdrew the proposed regulation. The following year, in the summer of 2012, DOL investigators visited three blueberry growers in Oregon’s Willamette Valley—Pan-American, B&G Ditchen Farms, and E&S Farms—and determined that they were failing to pay their workers the federal minimum wage. Inspectors also found an 11-year-old working at E&S, a violation of federal child labor provisions. Though the harvesters worked piece rate—paid by the box, tallied throughout the day on work tickets—growers were required by law to make sure each field hand received no less than the federal minimum wage. Investigators concluded that the companies were clustering multiple pickers on a single work ticket; without these “ghost” workers, each picker’s wages fell below the federal minimum. They told the companies that if they wanted to ship their blueberries, they would have to sign a consent order agreeing to pay back wages to 1,300 harvesters ($240,000 in total, including penalties) and submit to regular audits in the future. Otherwise, the agency would seek an injunction in court. Within days, the Oregon Farm Bureau’s opposition had sparked protest letters to the DOL from the state’s Department of Agriculture and Bureau of Labor and Industries. The bureau’s media campaign soon gained the backing of conservative think tanks instories with headlines like “Hot goods’ orders amount to overregulation, experts say,” which quoted a fellow at the Heritage Foundation and a spokesperson for the American Farm Bureau, whose major backers have included agricultural giants Monsanto and Archer Daniels Midland. Just a day after the farmers signed the agreement with the DOL, the Oregon Farm Bureau scheduled a meeting with Democratic Rep. Kurt Schrader of Oregon, a former strawberry grower who represents part of the Willamette Valley. Schrader’s biggest financial support comes from agriculture: During the 2014 election cycle, the industry donated $104,900 to his campaign, putting him among the top 10 recipients of agriculture money in Congress. He championed their cause in Congress, introducing a bill—written in consultation with the Oregon Farm Bureau and backed by the national Farm Bureau—to prevent the DOL from ever applying hot goods to perishable crops again. In August 2013, the two growers sued the DOL in federal court, and in January 2014 a judge ruled against the agency, concluding that the growers had signed the agreement under “economic duress.” In 2015, the parties settled: The Department of Labor agreed to pay back much of the $219,000 it had collected, plus a $30,000 settlement to each grower. In the end, just $75,000 in unpaid wages was returned to the workers. It was a significant blow to Weil’s Wage and Hour Division. Weil had arrived a firm believer in the hot goods provision. In fact, he had just authored a book, The Fissured Workplace: Why Work Became So Bad for So Many and What Can Be Done to Improve It, in which he noted the remarkable successes hot goods had achieved in the garment industry and recommended expanding its use to other industries. But the blueberry battle would make it harder than ever to use hot goods in agriculture. But what about hot goods? While Weil agreed that it was “one of the most powerful tools we have in the arsenal,” he said it had “to be timed and deployed very carefully” in agriculture, an apparent reference to short harvest periods. He added that many violations Labor inspectors have found dealt with housing and transportation, which fall under the Migrant and Seasonal Agriculture Worker Protection Act, not the FLSA. Since the case was never litigated, no court ever determined how badly the two blueberry farms underpaid their workers. What is certain is that the case galvanized the agricultural industry, which has since pursued a range of strategies to strip the DOL of its most powerful enforcement tool. And they have been at least partially successful: While Schrader’s bill has not yet passed, he joined forces with the Farm Bureau to insert a clause into the 2014 Farm Bill that requires the secretary of agriculture and secretary of labor to “consult” about the use of hot goods when applied to perishable agricultural goods. And passage of the 2014 bill coincided with a steep one-year drop in hot goods cases in the fields. In 2014, the agency pursued seven hot goods cases in agriculture, which represented the highest number of cases in more than a decade. In Hawaii, the provision helped the agency recover $428,000 in wages and damages for Laotian workers paid just $5 an hour to harvest basil and other herbs. In California, blueberry workers won back more than $100,000 after labor contractors were found to have put two and sometimes three people on a single work ticket, the same practice alleged in the Oregon case. Hot goods was deployed in agriculture only once in 2015. Faced with an anemic enforcement system, farmworkers have been turning to creative solutions to fight wage theft. In Oxnard, CAUSE is leading a campaign for what it calls a Farmworker Bill of Rights. The proposal, if passed by the Board of Supervisors in Ventura and Santa Barbara counties, would add labor investigators , increase penalties for wage theft, and create an anonymous tip hotline for workers to report abuses. It’s one small attempt to increase the woeful resources that currently exist to protect farmworkers. As Weil admitted, federal Labor inspectors are stretched way too thin. And the state is in even worse shape: California has just one labor inspector in the Santa Barbara office, responsible for a region 200 miles long that is home to nearly 1.5 million people. In Washington state, blueberry harvesters at Sakuma Brothers Farms have called for a global boycott of Driscoll’s, the giant berry company that buys from Sakuma—and the largest strawberry company in Oxnard. The workers at Sakuma, who have organized an independent union, charge that they are paid less than the minimum wage and required, just like Vasquez, to work through their breaks. In 2014, Sakuma paid $850,000 to settle a federal lawsuit over similar allegations. Additional reporting by Mariya Strauss. The Grind is a yearlong series looking at the unsavory — and often hidden — working conditions behind some of our cherished annual traditions. It is a collaboration with The Investigative Fund at The Nation Institute, now known as Type Investigations.